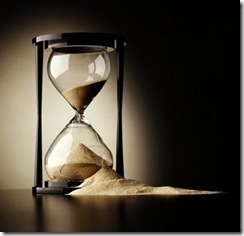 Not Enough Time For Me – God's Grace ~ God's Glory! The words “not enough time for me” stood out, as a meaning beyond what I was originally thinking. And here’s the meaning. If I am to serve Him, and fulfill His purpose for my creation and redemption it will take all my time. There is no time left for me if He is to do all His will and complete His work in me. Jesus, in response to Mary when she and Joseph found Him at the age of twelve, conversing with the religious leaders, said, “Did you not know that I must be about my father’s business?” (Luke 2:49) He knew His purpose for being here, in word and deed ~ “to proclaim and bring to reality the good news of the kingdom of God” (Luke 4:43). He had only thirty-three years, yet every minute counted for our justification, sanctification and glorification. As I experience these last years and see how close I am to the end of this life there is a stark realization that a lot of my time has been wasted on me. But, the Lord has been gracious to fill my life with the needs of others, not leaving much time for me. Even in my weakness He is able to make life count for Him. Nothing is wasted, but He will bring all to His own glory, as we realize the true joy in service to Him and others. He is continuing to teach me to be content with what He is doing in my life and the lives of others, though I wish I could do more. I am still learning what it means to lose my life and to have true life. Anyone who has been born of His Spirit can witness that writing about Him, proclaiming His kingdom, praising Him and serving is never enough. We long to see Him, to serve Him, and worship Him without hindrance from anything in ourselves. What a glorious day that will be. Heavenly Father, thank you that you will complete the work you have begun in each of us. In Jesus’ name I thank you and praise you. Amen.